Urban experts, pols and even irate commuters gather to call for someone — Andrew #StatusCuomo, perhaps? — to fix the transit hell. A new civic group’s demand for better conditions at Penn Station had everything going for it on Wednesday — committed urban planners, supportive politicians, major partners and even a few irate commuters — but it lacked one key element: a plan. The group, Public for Penn Station, admits that it exists only to call for politicians — specifically Governor Cuomo — to create a long-term vision for the substandard rail station and the surrounding hellscape above ground. But the pushing and prodding process has to begin immediately. Wright and others emphasized the need for immediate planning because overall congestion in Penn Station is expected to dip below its current 650,000 users after some Amtrak users are diverted to the Moynihan Train Station to the west in 2020, and many LIRR riders terminate their commutes in Grand Central, thanks to the East Side Access service that begins in 2023. Plus, Madison Square Garden’s permit expires in five years, and many believe the most famous arena in the world will be relocated yet again. 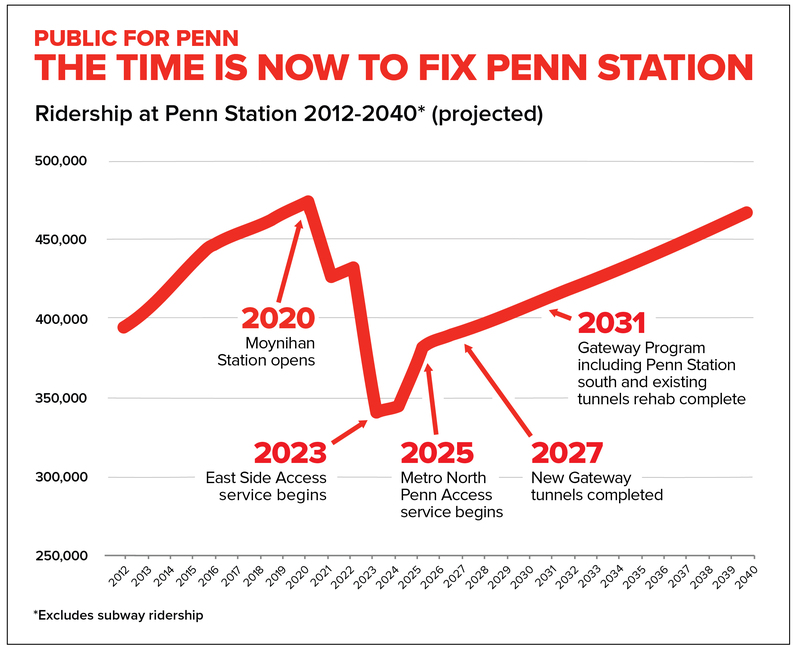 The 150,000 riders who shift away from Penn Station will be more than replaced after Metro-North starts diverting some trains to the western terminus in 2025 and after new Gateway tunnels are built. Eventually, there will be far more commuters using Penn Station than there are today. Some leaders, including State Senator Brad Hoylman and Manhattan Borough President Gale “Double Parking Is Fine With Me” Brewer, were on hand to show their support, but also admitted that it’s up to Andrew #StatusCuomo to paint the big picture. Cuomo’s initial effort — announcing last month that he would permanently close W. 33rd Street to cars and install new entrances to a supposedly enhanced train station below — were praised, but seen as too little. When Goldstein says “everyone,” she’ll get a friendly ear from Ed Janoff. The urban planner spoke at Wednesday’s event as a regular LIRR commuter, and summoned Dantean imagery to describe his experiences at Penn Station. The governor’s office did not respond to an email seeking comment (update: see below). Wally Rubin, the district manager of Midtown’s Community Board 5, was surprisingly optimistic. He said the governor called him before his W. 33rd Street announcement — which he admitted was strange. The Governor has said for years the situation at Penn Station is unacceptable and likened it to the seven layers of hell which is why he’s doing everything in the state’s power to transform the area including building a new Moynihan Train Hall, constructing new entrances and expanded corridors at Penn, making dramatic LIRR infrastructure improvements and pushing the federal government to help replace the crumbling Gateway tunnels. He doesn’t need to think bigger, but smarter. LGA plans are big, but they’re stupid because they don’t add capacity both on the tarmac or getting to and from the airport. I think it’s fine to build advocacy and stage public events without having a plan to propose as an alternative, especially a detailed plan. 2. Building advocacy helps lay the groundwork for better planning in the future, it is not the ends itself. For example, I can protest Donald Trump’s decisions as president, but that doesn’t mean my protest is invalid if I don’t have a plan myself to be a better president. I look forward to the plan for another mall. The organizational fix to Penn Station is NJT/LIRR consolidation and through running. The structural fix to Penn Station, which can only occur after the organizational fix, is to reduce the number of tracks so platforms can be increased in size. Allowing people to wait on the platform. A neat waiting room is irrelevant for a commuting station. -Reminder that the current “maze” is largely the result of how terrible the original penn station design was (same exact layout), and the organizational separation of former Penn Central lines (NJT/LIRR). Through-running is the central fix. A new train hall (kicking MSG to 10th Avenue) is the secondary fix. These are nearly equally important. I’m really not filled with confidence in someone who describes Penn Station as the “busiest station in the world.” Its not even close. There’s a station in Tokyo that has 6 times the weekly number of passengers. At Chicago Union Station, passengers wait on the platforms while the incoming trains pull in and discharge reverse commuters…. Truly pathetic. I sometimes carry an empty soda cup and with a bit of arm-shaking the masses will part and allow us lowly reversees to drudge out of the platform area. Count your blessings Penn pax that you avoid this. Sometimes “laypeople” with decades of living nearby can offer minor suggestions to improve any plan. In 2015, a temporary sidewalk expansion relieved crowding on a block of 32nd Street with heavy foot traffic between Penn Station and Herald Square, but the project was scrapped after a trial run. Now advocates are pushing to bring it back, and they recently won the support of Manhattan Community Board 5. Will the MTA Make Room for a Pedestrian-Friendly 32nd Street? For one glorious summer in 2015, the block of 32nd Street between Penn Station and Herald Square had a wide, generous sidewalk. It was a huge relief for the throngs of people walking to the nation's busiest rail hub. But it didn't last. RPA proposes much-needed integration of regional rail in its Fourth Regional Plan, but doesn't push for the politically challenging reforms that will be necessary to build it efficiently.